Fast-growing shelter, hedging and nurse plant. Competes well with gorse. 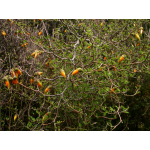 Laden with bright- orange fruit/seeds January-July, which attracts birds. Shade tolerant. Evergreen. Suits low-frost sites. Evergreen. 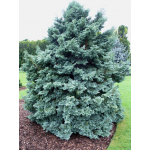 This is an attractive, semi-dwarf, evergreen conifer with a dense, upright and broadly pyramidal growth habit. 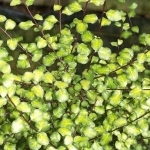 It is a conical grower with soft, silvery blue-green awl-shaped leaves which are not prickly but curve nicely to a fine point along the compact branches. 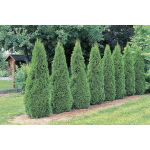 This is similar in habit to Chamaecyparis lawsonia 'Ellwoodii', but slower growing. 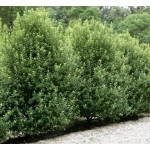 It has golden-green evergreen foliage tipped with gold all year round, a very popular choice for year-round interest. One of the most identifiable New Zealand native plants in the landcape. 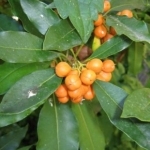 It has a tall straight trunk or trunks and a dense round head, with a sphere of long narrow leaves. 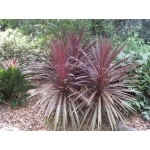 Cabbage tree produces a profusion of attractive and scented flowers in spring. It is an abundant seeder. It looks most natural in the ornamental garden if planted in groups. Three or more plants can be planted together in the same hole to produce this effect. It grows in all soils and situations, even in swampy ground, where little else of interest will grow. 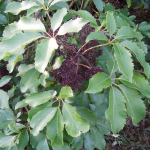 The purple leaved cabbage tree is usually smaller growing than the green and, therefore, more suitable for smaller gardens. Light-green foliage with narrow form and pendulous branches. Excellent shelter on light Canterbury soils. A small, tough, bushy tree with interlaced foliage. Laden with fruit that changes from white to dark blue, makes good pigeon food. Good low shelter. Evergreen. Hardy and tolerates damp. Ornamental small bushy erect tree. Attractive brown flaky bark. The long shining leaves are purple-red, intensifying in colour in winter. The seed capsule is most attractive in the autumn. Wind resistant, and grows in coastal sites. Good for shelter in light sandy soils. Very hardy for establishing in difficult soil. Ornamental small bushy erect tree. Attractive brown flaky bark. The long shining leaves are bright green and dense on erect branches. The seed capsule is most attractive in the autumn. Wind resistant, and grows in coastal sites. Good for shelter in light sandy soils. 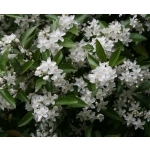 A medium-sized evergreen shrub of open, spreading habit, with leaves to 45cm in width and clusters of small, creamy white flowers late in the year. After the flowers come round black fruits. This plant comes from coastal areas of Japan and Korea and is valued for its tolerance of atmospheric pollution as well as its architectural foliage and habit. 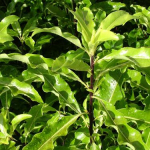 This broadleaf, native hybrid is a must for any garden that needs a screen, private area, wind protection or just an attractive evergreen plant with glossy deep green slightly wavy edged leaves. It is quick to establish itself and requires little maintenance or attention to thrive. 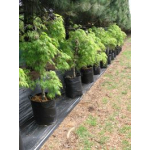 It can be planted in sun or shade and in moist free draining soils. 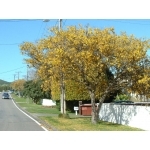 Small, round-headed tree with dark-green leathery leaves and bold yellow margins. Excellent for hedging or shelter. Withstands drought and coastal conditions. Trim in summer. Keep relatively well watered in the first few seasons to prevent them growing leggy. The striking colour of this form make it a great colourful filler or accent planting. Small, round-headed tree with light-green leathery leaves. Excellent for hedging or shelter. Withstands drought and coastal conditions. Trim in summer. 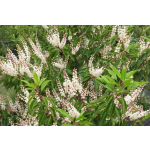 Attractive flowering tree with large leaves and scented white flowers. Prefers moist fertile soil. Good shelter and specimen, great in mixed borders. Has steeply ascending stems and branches. The smaller branches become drooping or even pendulous as the tree matures give the tree a graceful weeping habit. 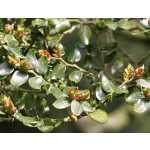 It has deeply incised, serrated and narrower evergreen leaves. In late summer and autumn it develops white scented, star-shaped flowers. 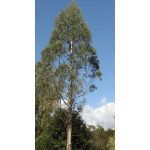 Kanuka is a fast growing tree found throughout New Zealand in forest and scrub. 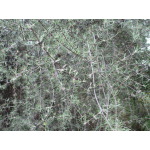 The leaves are softer to touch than Manuka and has smaller white flowers in Summer. It is very hardy, tolerating drought, frosts and poor soils. 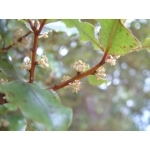 It is a primary colonising plant and used for revegetation as a nurse plant. 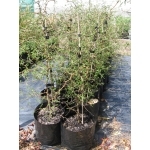 Both manuka and kanuka are used as a nurse crop with other early colonizing plants for revegetation / restoration planting and are also very effective in erosion control. Handsome specimen and timber tree. Young trees have bright-red foliage during winter. Rapid early growth. Strong durable red wood. Can clip to a formal hedge. 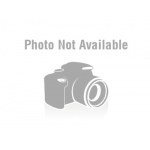 Suits a cool, moist, sheltered site with deep, well-drained soil. Evergreen. Tall, attractive tree with black bark and toothless leaves. Wind-hardier than other beeches. Suits moderately fertile, well-drained soils at low altitude in drier eastern areas. Evergreen. 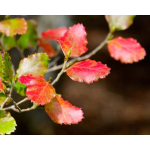 Graceful medium sized tree, smaller and slower than Black Beech and with a finer leaf. Tolerates hard, infertile, poorly-drained sites in alpine areas. 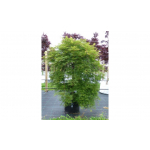 Bushy tree ideal as specimen or hedging. Lemon scented foliage and fragrant flowers (spring). One of the best variegated pittosporums. A vigorous grower Yellow and lime green foliage. Hardy to most soils and climatic conditions. Ideal as a specimen or hedge or screen. 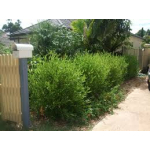 This native evergreen is fast becoming fashionable for its hedging and bordering appearance. 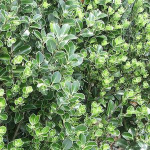 With its dense glossy, lime green foliage, it offers a neutral and maintenance-free back drop to many planting plans. Erect bushy tree. The dainty shimmering leaves are silvery green carried on slender ebony black stems. Great as a feature or a hedge. Very dark maroon, almost black flowers in spring. 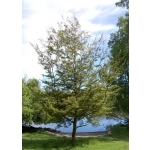 An attractive, large growing, hardy evergreen with lime to olive green leaves. Due to its neutral colour and texture, it provides a fabulous background for many garden designs and styles. This plant maintains a neat habit, is quick growing and ideal for screening out unwanted views, noise or wind. 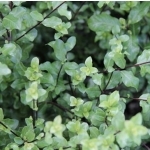 Compact shrub with small leaves variegated green and gold and set off against black stems. Makes a great hedge. Extremely popular, adaptable and quick-growing. 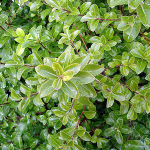 Shiny light-green foliage with wavy margins and reddish brown branchlets. Fragrant dark red flowers in spring. 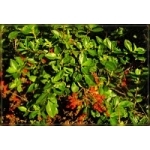 Exellent plant for hedging and shelter. 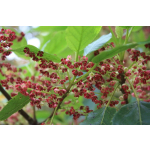 Deciduous tree grown for its foliage and flowers. Oval serrated leaves followed by tiny bracts of green/white flowers. This is one of New Zealand’s most common native trees found from Cape Reinga to Bluff in lowland forests. 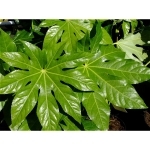 Its particular form of a glossy, five to seven fingered leaf along with quick and luxuriant growth. 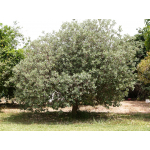 It grows into a small stout tree up to 5 metres high and grows well in most soils and situations. Fast growing with small purplish black berries in autumn. One of the most popular and hardy of its species. 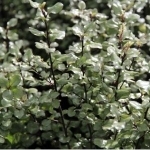 Attractive select form with dense, wavy silver/blue-green foliage that clips well. Also maintains a good oval form when left untrimmed. A great versatile hardy native. 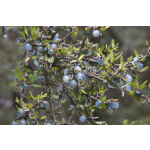 Suitable for hedging, screening and group planting. 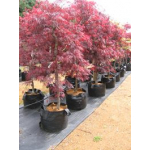 Attractive small tree with large, distinctive shiny broad leaves on red stalks. Leaves are larger than P. arboreus. Tropical appearance. Tolerates wind, exposure and shade. Fruit/seeds from February-May. Evergreen. Hardy to light frosts. 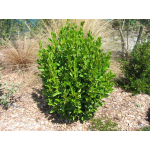 Hardy and versatile evergreen shrub with smooth dark green leaves. Produces slender white flower racemes late spring and summer. 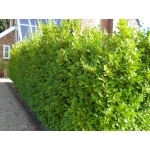 Creates an excellent formal hedge or screen. Tolerates a wide range of conditions from dry to frosty areas. A small-leaved kowhai which often goes through a tangled juvenile stage. There are many varying forms, some taking many years to flower. Suitable for planting as a shade tree. Upright tree developing open habit. Large golden flowers massed in spring. Requires good drainage. Dense, tangled wiry shrub with sparse foliage and hidden orange-yellow flowers in late spring. Semi-deciduous. Very tough on exposed, cold, dry sites. 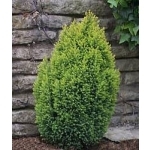 Thuja are fast-growing evergreen trees of narrowly conical habit, with flat sprays of tiny, aromatic, scale-like leaves and small knobbly cones. 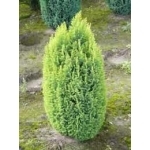 'Smaragd' is an evergreen conifer making a slow-growing conical shrub with erect sprays of bright green foliage. 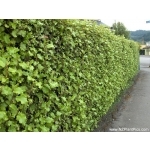 Plant will grow in height approx 30cm pa.
For a smart looking hedge plant 2 per metre. A rounded small tree with yellowish-green wavy leaves. Fragrant flowers are borne in autumn. A good shelter and hedge plant. Hardy and tolerant of coastal conditions. ‘Tamukeyama’ is a red-leaf, dissected (cutleaf/laceleaf) cultivar that grows in a mound or dome to 2m tall spreading by weeping and cascading branching to 2m wide. 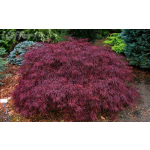 It features deeply cut and dissected purple red leaves that turn brighter red in fall. Foliage is noted for retaining good color throughout the summer. Small reddish-purple flowers in spring are somewhat attractive on close inspection, but are not showy from a distance. Flowers are followed by samaras that ripen in late summer to autumn. 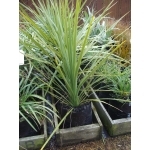 Palmatifidum is a fast growing dissectum which can often be wider than it is tall. 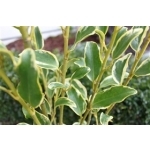 A sturdy and hardy shrub – its cascading form is accentuated by the long narrow lobes on each leaf. Soft green spring tones mature to darker green in summer with autumn tones of yellow, gold and orange giving a very colourful display before the onset of winter. ‘Trompenburg' (Matsumurae Group) is a small upright tree that typically rises to 4m tall over the first 10 years, eventually maturing to as much as 6m tall. 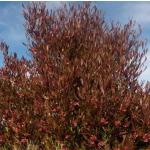 Foliage emerges dark reddish purple in spring with good color retention until late summer when it fades to reddish-green and bronze before turning showy crimson red in autumn. Each palmate leaf has 7-9 long, narrow-ovate, deeply cut, sharply-serrated lobes (divided close to the leaf base) with rolled edges (convex). Red leaf stalks. This cultivar was discovered as a seedling at the Trompenburg Arboretum in Rotterdam, The Netherlands. A native to South America. 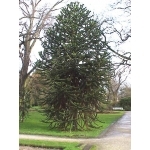 Popular garden tree, planted for its unusual effect of the thick, "reptilian" branches with a very symmetrical appearance. The original feijoa which many of the new varieties have been bred from, this variety has an open habit. Medium sized fruit appear later in the season on this large shrub. Self-fertile. This cultivar is noted for carrying its red colour right throughout the growing season. 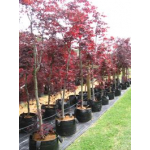 The foliage goes through many changes throughout the year: bright crimson colour in spring, deep red-purple in summer and fiery scarlet in autumn; an outstanding smallish weeping maple. 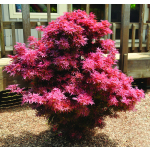 ‘Shaina’ is a dwarf Bloodgood sport that makes an excellent container subject, dense, compact and erect growth habit. Bright red new leaves mature into a maroon colour. Intense red autumn leaves. Easily trained into a ball shape. Fast-growing, small deciduous tree. Attractive rose-coloured flowers in spring. Black berries in summer are highly sought after by native birds. Good shade tree in sheltered areas. Frost-tender when young, however hardy once mature. 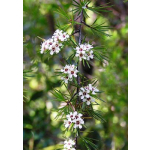 This small tree is found in shrub and forest margins throughout New Zealand. A handsome foliage plant with red stems and narrow wavy leaves. 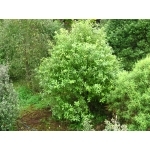 Matipou will grow in most situations and is used in native restoration and revegetation planting.